Hilo Exchange Club member Joey Estrella and club president Jay Kimura present an 'Officer of the Month" plaque to Chere Lyons. 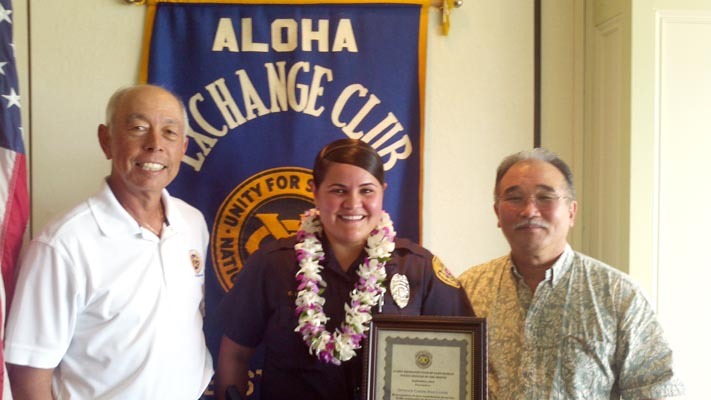 The Aloha Exchange Club of East Hawaiʻi recognized Officer Chere Lyons on Thursday (September 27) as “Officer of the Month” for September. Lyons, a South Hilo patrol officer, was honored for her quick arrest of a burglary suspect last month. At 7:48 a.m. on August 13, a Pepeʻekeo resident reported that a stranger was attempting to break into his neighbor’s house by removing glass jalousies. The neighbor shouted at the burglar, scaring him away, and called police. Officer Lyons spoke to the neighbor and other residents in the area and was able to obtain a detailed description of the unknown man. She also learned that other homes in the area had been broken into recently. Using her investigative skills, she was able to identify a suspect and verify that he was the same man who had been seen removing the glass jalousies. By noon, she located and arrested the suspect, who was later charged with attempted burglary. Lieutenant Robert Fujitake, who nominated Lyons for the honor, said in nomination papers that her “hard work and determination” are what led to a quick location and arrest of the suspect . “Her diligent work may have prevented more houses in the area from being burglarized,” Fujitake said.